Root canal therapy refers to a treatment in which your dentist removes the bacteria infection that has entered your tooth’s pulp or nerve chamber. Why would you need a root canal? There are several reasons why your tooth may become irritated and inflamed, such as: deep decay, big fillings, trauma to the tooth, a chipped tooth or even repeated dental work. Once your dentist has identified the infection inside your tooth you may be wondering what other options you have besides getting a root canal. The first is to do nothing. However, if the bacteria are not removed it will work its way to the tip of the root and eventually into your bone. Once it does, it will cause an abscess and infection. Obviously this course of action, or inaction, is not recommended. Your second choice is to extract or remove the tooth. Be aware if you simply extract the tooth, the space caused by the missing tooth will cause the surrounding teeth to shift into that space. This shift could cause a miss alignment in your mouth that can result in problems with your jaw. In addition, these shifted teeth are harder to clean, making them more susceptible to gum disease, decay or even additional tooth loss. If you do elect to pull the tooth your best plan would be to replace it with a dental appliance such as an implant or a bridge. This of course would add more expense to the treatment in addition to the loss of your tooth. First a local anesthetic is adminstered to numb the tooth so that the procedure is more comfortable. Next, your dentist will place a protective shield or a rubber dam to keep the tooth clean and saliva free. Once numbness sets in, an opening is made through the top part of the tooth. Root canal files are used to clean and shape the inside of the canals and prepare the root canal for a final filling material. During the process a cleansing solution is used to help clean out any remaining bacteria or tooth debris. X-rays may also be taken periodically during the procedure to inform your dentist of the ongoing process. When the root canal filling is performed, it is generally done by placing a rubber-like material with a sealer that fills the entire length of the root canal. A temporary filling is then placed on the tooth. Please keep in mind that root canal therapy treats the diseased pulp of the tooth, but the treatment is not complete until the tooth is restored to a functional stage. This means a crown, or a similar type of dental work is necessary to make the tooth operational again. 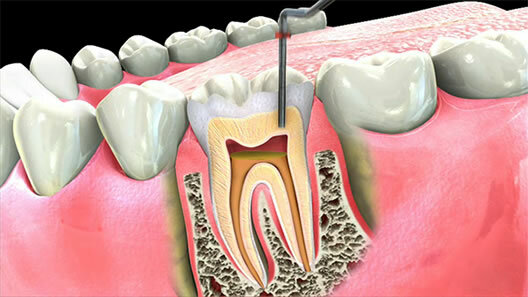 After completion of root canal therapy you might feel some discomfort for few days following the treatment. To alleviate the discomfort you can follow your dentist's recommendation on taking an over the counter pain medication. In more extreme cases your dentist may prescribe an antibiotic and prescription-strength pain reliever to help reduce any remaining infection. In the event that root canal therapy is unsuccessful, your dentist can discuss alternative options including repeating the treatment or extracting the infected tooth. Get started with the right MediaMed Solution for your practice!.